Blood Suckers™ old layout but crazy payout ! BLOOD SUCKERS™ is a video slot game which we owe the Swedish giant Netent. Whether it be on mobile or on laptop, this game transforms slot players into vampire killers. It is well known that vampires do not like light, which is why the game takes place in darkness. Some bloodstains, some bats, some skulls and a bone-chilling wind in as sound effects… The slot provider has created an atmosphere worthy of a horror movie! The low paying symbols represent the most effective weapons to repel or kill a vampire: a clove of garlic of which they cannot bear the smell, a bow and arrow ready to pierce their hearts, a bible and a cross – two sacred objects which scare them off – and a potion. Other symbols represent different types of vampires : a woman with bat wings, a creepy vampire with a greenish skin tone and orange eyes, a vampire with long blond hair, holding in its hand a glass filled with the blood of one of its victims and a dark creature of which’s mouth you can see blood droplets falling. All these symbols animate when they form a winning payment line. The graphics of the special symbols are even more frightening. The wild symbol represents a vampire and a young lady. When the wild plays its role of substitute on one of the 25 bet lines, one can see the monster biting its victim in the neck and blood shedding. The scatter symbol represents a female vampire dressed up as a bride, when you obtain at least two of these scatter symbols she jumps onto the screen as if she was trying to escape from the slot machine. The bonus symbol represents a coffin and two blood stained weapons, which gives the player a foretaste of the Vampire Slaying bonus game during which he will enter a room filled with coffins in order to kill a maximum of vampires. We also appreciate that the Big Wins are displayed on the screen in a pool of blood. Netent has really thought about everything! BLOOD SUCKERS slot is a 5-reel 3 –row slot, with 25 fixed bet lines and left to right combinations. It however stands out thanks to its high RTP of 98.00%. With a max bet of £50, it is possible to win the max win of £50,730 in the main game. The paytable of the game shows the machine will pay up to 500 coins for a line of 5 regular identical symbols (75 coins for a garlic or crossbow symbol) and 7,500 coins for a line of 5 wild. The wild symbol may replace about any other symbol, except from the special symbols, which are the Bonus and the Scatter. These substitution symbols may appear at any moment on the reel and on any row, but they must appear on one of the 25 pay lines in order to form a winning combination and leading to a prize being obtained. On top of a high Return to Player and an important hit frequency which reaches 46%, meaning that the machine generates winning on average 4.6 times out of 10, playing this online slot machine is even more exciting due to its special feature : it’s free spins and it’s Vampire Slaying bonus game. In order to enter the Free Spins, which display a hit frequency of 0.5%, one must obtain 3 scatter symbols of more. During the 10 Free Spins, the winnings are subject to a 3x multiplier. This slot machine allows one to obtain additional Free Spins during the free spins. To unlock the re triggered Free Spins, one must obtain at least 3 scatter symbols. During those extra Free Spins, the winnings are not multiplied. The Bonus Game feature is fascinating. In order to trigger it, one must obtain at least 3 successive bonus symbols (on consecutive reels starting from the first reel on the left) on one of the 25 winning lines of the game. The player then enters a room filled with coffins and he must open them one by one so as to kill the vampires trapped in them with a wooden stake. The bonus feature continues as long as there are vampires in the chosen coffins, and reaches an end when the coffin chosen by the player does not contain any frightening creature, aside from a few bats which make use of this opportunity to escape. Each vampire killed pays a certain number of coins. The changes to get the Bonus round is higher than the Free Spins frequency hit, 2.1% meaning as per Netent stats that for every 100 bets, one will enter the Bonus round 2.1 times. 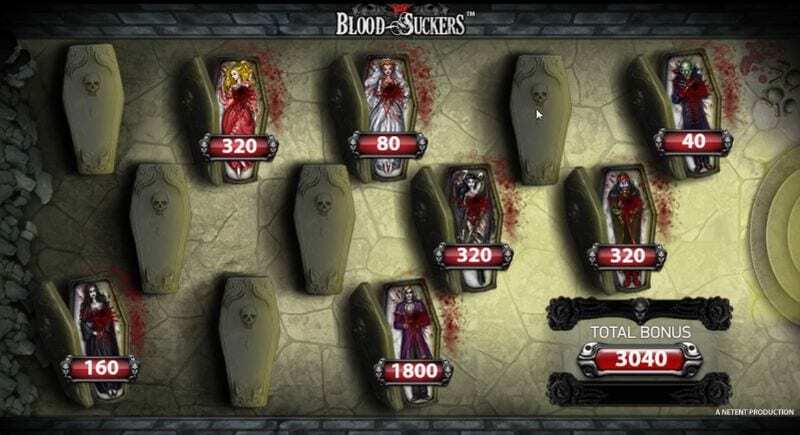 BLOOD SUCKERS slot will delight players who enjoy the mystical and terrifying side of vampires and feel ready to kill them one by one in order to obtain winnings! This machine is accessible with a minimum bet of £0.25 and a maximum bet of £50, and allows one to win up to £50.730 during the main game and up to £45.000 per winning line during the Free Spins. A great casino slot ! 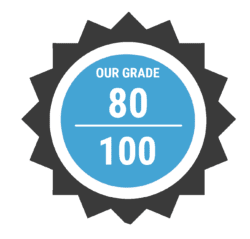 Sporting a general RTP of 98%, this online slot game by the provider Netent is a game which pays well.